Be natural and smart when you shoo pests away. EcoSmart natural home pest control utilizes safe ingredients such as rosemary oil to get rid of unwanted pests. This is your chance to try out some natural pest control for the home for free. 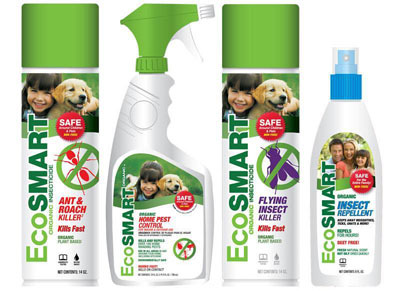 One winner will receive a value bundle from EcoSmart, contest sponsor. To enter the contest, please indicate in comments which value bundle you’d want if you win: Safe Home (pictured), Safe Plant and Garden, Safe Picnic, Safe Personal Care, Safe Lawn and Outdoor, or Safe Patio. Open to US residents only (excluding Alaska and Hawaii). Must comment on this post before 11 pm CST on Thursday, March 25. Randomly selected winner will have three days to respond to my request for a mailing address, so please check your spam filter. For more info on contest policies, visit the Privacy + Disclosures page. UPDATE: 3-28 Congrats to the winner, Brian N.
I would like the safe plant and garden. I keep having ants get in my herb garden. I have tried everything from boiling water to diatimacous earth. Nothing will stop these mutant ants. I’d go for the repellent. My kids love the woods, camping and just being outdoors but always get ate up by mosquito’s. And when we go to the lakes, those pests tend to cut into what’s supposed to be our relaxing, evening boat rides. Would love to win the safe home bundle! I hate ants and always get them in, so as the weather gets warmer this kit would come in handy! I would like the Safe Picnic. Thanks for the chance. The Safe home kit has everything I could want! Thanks! Safe personal care value bundle I would choose.. I could use the Safe Home Bundle. I would like the safe home value bundle. I would like to have the Safe Plant and Garden Value Bundle. We garden organically and these products look great! I would like the Safe Home Bundle. Hello, I would like the Safe Lawn and Outdoor Value Bundle. Between the weeds and wasps, this would come in handy. Thanks for a great giveaway! The Safe Home Value bundle, with its four different products, would be a good way of trying Eco Smart. I would like them all! 🙂 The one I would most like is the Safe Lawn and Outdoor. The Safe Home would be my top choice – thanks! I’d like to win Safe Plant and Garden. I’d like the Safe Personal Care. Thank you! I would love to have the safe Lawn value bundle. I would choose the Safe Patio Bundle. I would love to have the Safe Plant and Garden Bundle. Thanks. I’d want the Safe Home to use around my pets. Safe Lawn and Outdoor. My cats like to veg out in the yard, then snuggle up with us. We would love to try the Safe Home Value Bundle. Safe Plant and Garden Bundle. I would want the Safe Personal Care.